The Shelley-Godwin Archive is the result of a collaboration between the New York Public Library and the Maryland Institute for Technology in the Humanities (MITH). The project was funded by the NEH from 2011 through 2015; it is unclear whether the site continues to be updated as of early 2019. What is the archive’s purpose? What criteria did they use? On what basis were items added to this collection? Why were some items excluded? To what extent is what’s being presented a subset of what’s available? Some of these questions, particularly about who assembled the archive and the archive’s purpose, are answered on the “About” page. However, any researcher who is engaging with these digitized primary sources for scholarly purposes would have to do some digging about the criteria used to add or exclude items. The site includes five main tabs: Home, About, Explore the Archive, Search, and Using the Archive. A scrolling panel at the top of the archive’s Home page provides an immediate point of reference about the writers who are represented in the archive, as well as different versions of one of the archive’s most famous literary works, Frankenstein by Mary Wollstonecraft Shelley. The digitized primary sources included in the archive represent manuscripts for works of literature and political philosophy. It is likely that many of the site’s users have access to and are most familiar with the published version of these works. However, the order in which some of the manuscript materials appear in physical collections may differ from the published order. Browsing the archive “By Work” allows a researcher to explore the pages of a manuscript in their published order. Alternatively, browsing the archive “By Manuscript” allows a researcher to explore the pages of a manuscript in the physical order in which they appear in a collection. The Search page has robust functionality for finding the sources that are most relevant to a user and refining a search. The archive’s Introductory Video helpfully uses the example of searching the term “lightning” to demonstrate how a researcher can find all of the instances of the word “lightning” that appear in the digitized primary sources, and then refine the search results by work, manuscript, and/or by author. Once a user finds a work to examine more closely, they will see a webpage similar to the ones below that includes a source’s metadata, a source’s Transcription Status and Metadata Status, and one page of a primary source alongside a transcription of that page (if available). 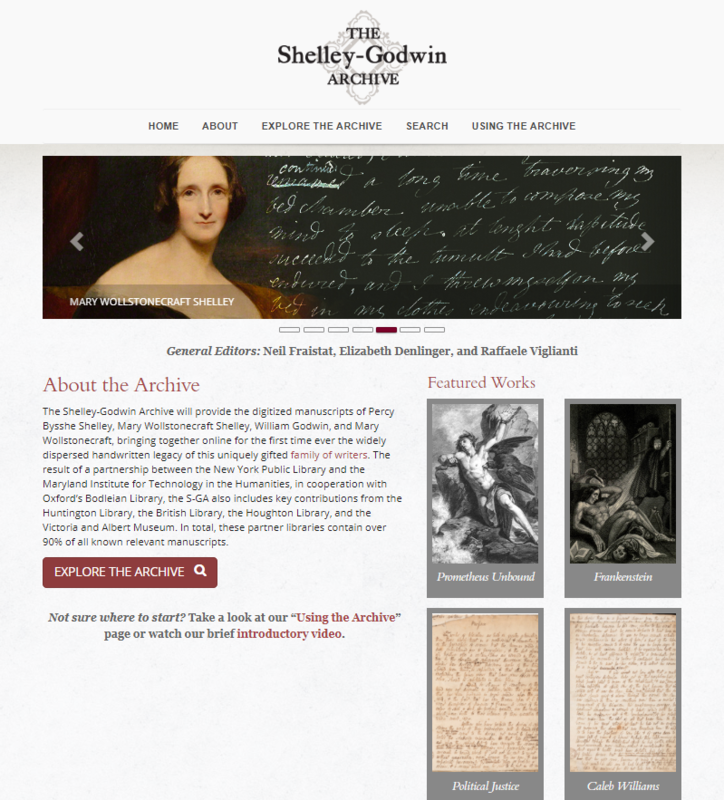 Overall, the Shelley-Godwin Archive provides access to digital representations of valuable primary source documents that might otherwise be inaccessible to researchers across the globe. It has robust functionality for finding and examining sources, and provides useful, clear instructions for how to use the site’s features. The site also conveys some important contextual information about the Archive and the primary sources themselves. However, anyone using the archive for scholarly research should think critically along the lines of the questioning that Trevor Owens raises in “Digital Sources & Digital Archives: The Evidentiary Basis of Digital History” about how a primary source has been rendered digitally, how a researcher has encountered that source, and what is gained or lost in the process.